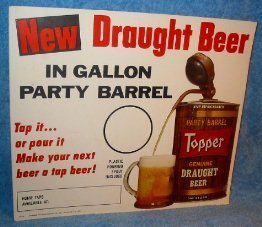 Topper Draught Beer party barrel; 15 1/4 x 13 1/4 inch, cardboard point-of-sale sign with an easel stand on the back. I would think this is from the 60’s. Great subject matter and very nice shape. Corner points are soft and there is a faint wrinkle in the top left corner.